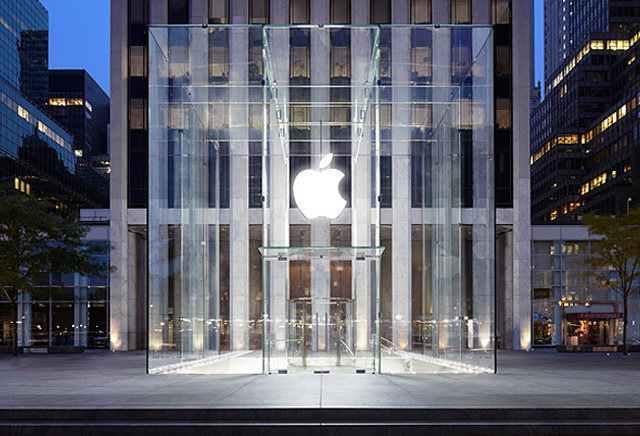 Douglas Linde, president of Boston Properties, in an earnings conference call on Wednesday said that the glass cube-topped underground Apple store will grow from about 32,000 square feet to 77,000 square feet, reports Bloomberg. The Boston-based company is co-owner of the General Motors Building and acts as Apple's landlord for the Fifth Avenue location. Linde also confirmed Apple as the "mystery" tenant Boston Properties has been discussing for the past year. The Cupertino, Calif., tech giant was for months rumored to expand its flagship New York City operation, but plans for a supposed mass expansion were left unconfirmed until today. While construction workers build out Apple's new digs, the company is operating out of a temporarily location in what used to be FAO Schwarz. Reports last year claimed Apple was negotiating a permanent expansion into the former toy store, a spot the company supposedly felt "entitled" to for drawing in foot traffic with its main Fifth Avenue outlet. The iPhone maker apparently abandoned those plans, allowing Boston Properties to lease the space to athletic clothing purveyor Under Armour. Neither Apple nor Boston Properties has released an estimated timeline for project completion, but Apple spokesman Nick Leahy said the company expects an "incredible" new Fifth Avenue store "where our customers will enjoy new services and experiences in a much larger space," the report said. Renovations at Apple's Fifth Avenue store began on Jan. 20. Outside of Manhattan, Apple is rumored to have signed a 10-year contract for a new retail location in Fort Greene, near downtown Brooklyn. The company opened its first Brooklyn store last year in Williamsburg, just north of the borough's population center.